Canadiens agree to terms on a three-year contract extension with defenseman Andrei Markov. MONTREAL – Montreal Canadiens general manager Marc Bergevin announced Monday that the team has agreed to terms on a three-year contract extension with defenseman Andrei Markov (2014-15 to 2016-17). “We are very happy to have secured a long term agreement with Andrei. He is an important part of our group of core players. He is healthy, shows a very good work ethic and has great leadership skills. He plays big minutes against the top opponents, and game-changing defensemen of his calibre are hard to find” said Canadiens general manager Marc Bergevin. “I am very pleased to be a member of the Montreal Canadiens organization for the coming years. I love Montreal and I am very confident in our group of players. I want to contribute to the success of our team,” said Andrei Markov. 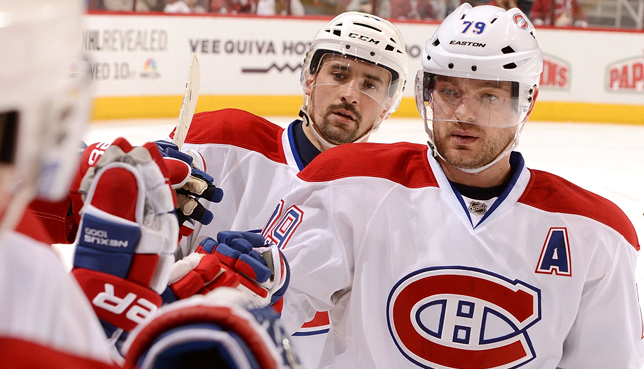 In 81 games with the Canadiens in 2013-14, Markov totaled 43 points (7 goals, 36 assists). He tallied two goals on the powerplay and scored one winning goal. The 6’00’’ and 201 lbs defensemen recorded 131 shots on goal and a +12 differential, while averaging 25:14 of ice time per game. The veteran defenseman added ten points (1 goal, 9 assists) in 17 playoffs contests. Markov, 35, has produced 442 points (98 goals, 344 assists) in 765 regular season contests since his NHL debut with the Montreal Canadiens in 2000-01. He has scored 51 powerplay goals, three shorthanded tallies and 18 winning goals. He shows 29 points (4 goals, 25 assists) in 71 playoff games throughout his career. A native of Voskresensk, Russia, Markov was drafted by the Canadiens in the sixth round, 162nd overall at the 1998 NHL Entry Draft. He suited up for Russia at the 2014 Olympic Winter Games in Sochi, 2006 in Torino and 2010 in Vancouver.